Many horse lovers say, let people hellbent on eating horse meat suffer the consequences. This what they typically refer to. Horses are not traditional food animals. Except in very rare cases horses are not raised for slaughter for human consumption. Therefore horse meat contains toxic residues from drugs widely given to horses throughout their lives. Buyer beware. 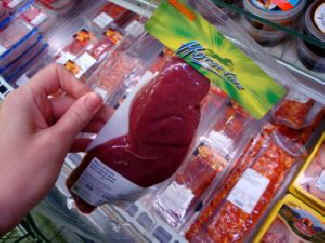 Package of horse meat, Switzerland, probably full of yummy cancerous toxins. One such drug is phenylbutazone, commonly called bute. Bute is a banned substance. Meat from a horse who has been administered bute in his or her lifetime is, according to EU regulations, never allowed to enter the human food chain. There is no withdrawal period; these residues do not “cook out”; they are potentially carcinogenic. Yet, in an article by the Belfast Telegraph, they report that Irish horse meat is ending up in European restaurants. The meat comes from ponies to former racehorses. Animal investigators have said criminal gangs, who advertise on the internet for unwanted horses, are shipping the Irish horse meat across the channel making millions out of the dangerous operation. These gangs know nothing about the history of these horses, or the types of drugs they have been given. Since the article states that gangs are “shipping the Irish horse meat”, this heavily implies it is sold on the black market, available to anyone who wants to buy it including restaurants, and the horses are slaughtered by backyard butchers.